No one is ever too old to play with toys, and Toyota knows this, so they equipped the 2017 Toyota Sienna with more toys than you can imagine. It’s one big toy box. Toyota knows that you would rather be playing, so they packed the Sienna with so many things to play with that you’ll enjoy every road trip, including a commute to work. They even built the Sienna as an escape vehicle for you and the family by giving it a seating capacity of up to eight people. 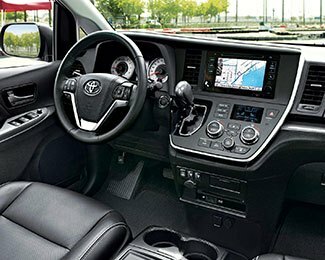 The cockpit alone of the new Sienna looks like the cockpit of a futuristic space ship with its compact design that arranges all of the controls within easy reach. You’ll find the shifter on a dash panel by the steering wheel and under the touchscreen in a throwback attempt to the days of the column shifter, yet with a familiar console shift layout. It all starts with the easy-to-read 7-inch touchscreen mounted in the centre of the dash. It’s there that you’ll find everything you need to know about the vehicle and the controls for your environment. The infotainment system comes equipped with Bluetooth® capability, and the steering wheel audio and voice recognition controls help keep you focused on the road in front of you instead of being distracted by answering a phone or changing the radio station. The Siri Eyes Free mode enables voice control over your iOS device that has been linked to the system. It understands natural language commands and lets you do more than make and take calls; it can select music for you and read or send text messages. It can even make sure you don’t get lost along the way by being able to access maps and get directions for you. Plus, it has a built-in reminder system that can help you remember important information like when to change the oil or your mom’s birthday. The kids are probably going to appreciate this more than you will simply because you’re supposed to be watching the road while you’re driving. Of course, they might let you watch movies too on the Dual View Blu-ray player the next time you stop. This 16.4-inch overhead wide screen display is mounted on a drop down panel in the roof behind the front seats. It is capable of broadcasting a widescreen movie on it, or it can be split in order for two people to watch two different movies or play two video games simultaneously. This helps eliminate any fussing between siblings during long trips. To make it easy on you, the system comes with dual wireless headphones that keep the cabin noise down. The Blu-ray player is part of optional packages available on the SE and XLE models. While many of the high-tech toys are for fun, others have a really serious job to do in order to make the Sienna a safe vehicle for you and your family. 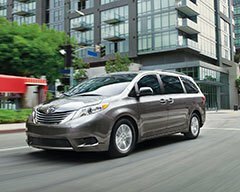 The 2017 Sienna comes standard with the Toyota STAR Safety System that includes six accident avoidance technologies. The ABS, Brake Assist and Electronic Brake Force Distribution are designed to help prevent a lock-up and skid. The Vehicle Stability Control and Traction Control help you stay in control, and Smart Stop technology makes hill starts easier.